Free firewood. This is not a joke. We repeat this is not a joke. We have a plentiful supply of FREE firewood and wood chips, so come and grab it! If you live in the Portland area, firewood is available directly from our job sites or our offices, as well as wood chips. Don’t have a truck? Not a problem. 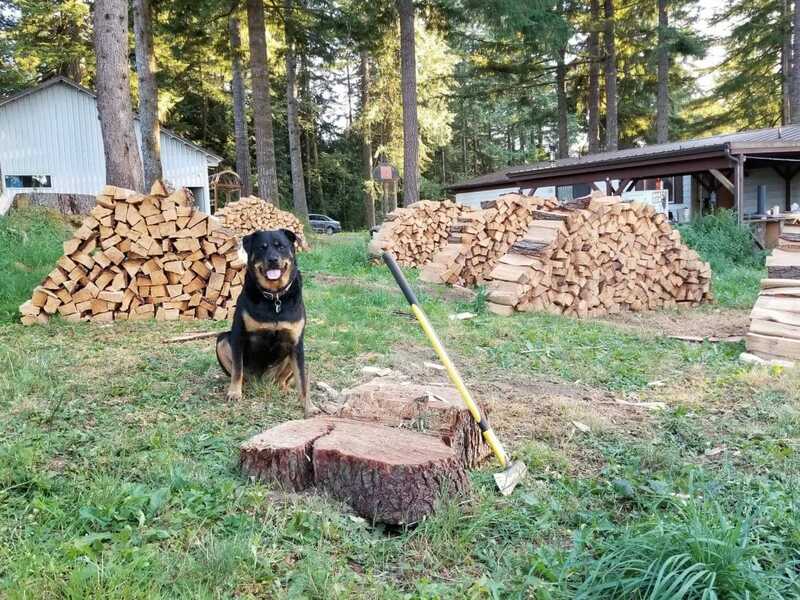 We’ll bring the wood chips to you for free (limited area in and around Portland), or, we can bring the firewood for a small fee. Any way you chop it (get it?) – this is a great deal. We remove a lot of trees. And they come in all shapes, sizes, and types. So, expect a wide mix of hardwood and softwood, and some not-so-uniform cuts. We all know what firewood is for. Fill the fireplace or fire pit and bring on the s’mores. But, need some ideas on what to do with your newly acquired pile of wood chips? Keep reading. We’ve got all the ideas you need. Here’s what you can do with all the free wood chips after we deliver them to your house or business. Mulch – Mulch is a necessity for any yard, and is perfect for planting new trees. Mulch helps plants retain water and stay warm. Check out our past blog post about what makes mulch so great. Composting – Wood chips do a fantastic job at enriching soil, so take your free wood chips and create a carbon or “brown” layer in your compost pile. Paths and Play Areas – With extra wood chips, why not create new paths across your backyard or property? Wood chips are great for suppressing weeds and are soft beneath the feet. Play areas are another great use, cover the ground under the swing set with wood chips for a wonderful non-slip surface. Keep in mind that wood chips may make it more difficult for those in wheelchairs or with other mobility issues to navigate your yard or play area. Crafts and Decor – Wood chips are full of fascinating colors and shapes. Use them to fill the bottom of a flower vase or to create stunning patterns across furniture or other surfaces. Temporary Erosion Control – With so much rain in Portland, wood chips can be a great resource to patch up erosion problems while you figure out a long-term solution. Wood chips can be used to create a barrier to prevent soil loss, especially during heavy rains, while you figure out some better drainage options. In addition to supplying firewood to the masses, we perform a plethora of tree-related services. Whether it is tree pruning, removal or help with a sick tree – we have certified arborists standing by to answer all of your questions and help you get the most out of your trees. We cover a wide area, assisting both residents and business owners in Portland and the surrounding communities. Give us a ring to pick up free firewood, wood chips or schedule one of our other tree services.